For international donors. THANK YOU! The Basle located association sprachmobil.ch would like to let build a vehicle, which can park in parking lots or in parking spaces on the street in front of homes and institutions where asylum seekers and refugees live and work and in which these people can get in touch with and learn the german language. This project is fully established and run by volunteers and we would like to be present with our vehicle in the public space. Now we start a crowdfunding campaign to collect the missing 20'500 Swiss francs. We collected already 12'000 Swiss Francs. With this money we can run and operate the rolling Learning and Meeting Vehicle for about 24 month. And wthin this 24 month we will have time to collect the remaining lease-payments. Our vehicle, a mobile learning and meeting space, will be able to cater for up to six refugees. It will be a classic and modern furnished learning space. If the weather allows it we sit in a circle in front of the vehicle. If it is chilly outside or if circumstances require it we sit inside. We will be present with our service in the four Kantons Basel-City, Basel-Country, Solothurn and Aargau. It is our sportive goal to have the vehicle on the road early summer 2018. Thank you very much for your donations, and you know within a crowdfunding you can get very nice benefits. Thank you for your money, thank you for your support for a flexible and modern project, which will help refugees who came to the northwestern part of Switzerland to integrate easier into their new environment. We will bring learning German towards the refugees. A small group of experienced man and women (psychotherapist, psychologist, social worker, project manager) will create a special manual, which will be the layout for the casting of the volunteers. After the financing for the first two years is secure we will start with this process. We will then recrute men and women volunteer. And the vision is clear: one day our service will be operated and run by volunteers who came as refugees to Switzerland. The vehicle will have two components. A chassis and a customized box-type van body. The box-type van body will measure approx. six square meters. There will be at least three windows and a door. The floor will be wood like panels. The box will feature a classical, modern and unfuzzy, rectagular learning-space. The interior consists of seven modern chairs, an installation for a beamer and a screen, bright lights and storage place. The learning-meeting-circles will happen in the van body (there will be a heater) as well as outside, in hot weather condition under a sunblind. What are the objectives of sprachmobil.ch? sprachmobil.ch has clearly two objectives, an educational/integrative and a more political-civic one. First and foremost we think that already if you can speak only a few bits of German your self esteem and confidence can grow. To learn German will promote your independence, which marks the beginning of Integration in a society. For people who come to a strange environement it is essentiell to learn and speak the local language to establish the feeling of belonging and be part. Our second objective is to achieve that the whole subject of flight, migration and integration and their main actors become more visible. It is our intention also to promote the interaction between refugees and people who already live here. It is part of our vision that our vehicle, which e.g. is parked in front of a dormitory for refugees or in front of a asylum camp or on the market place of a small community will also attract residents who would like to get in touch with refugees. Who are the target groups of sprachmobil.ch? The main target group of the project sprachmobil.ch are refugees and asylum seekers who came or were told to by the Swiss Goverment to live in the northwestern part of Switzerland, in the Kantons Basel-Stadt, Basel-Land, Solothurn and Aargau. They live in asylum camps, dormitories for refugees and appartement buildings. And we would like to reach also groups within this community, f.e. only women, only unaccompanied minors and so on. 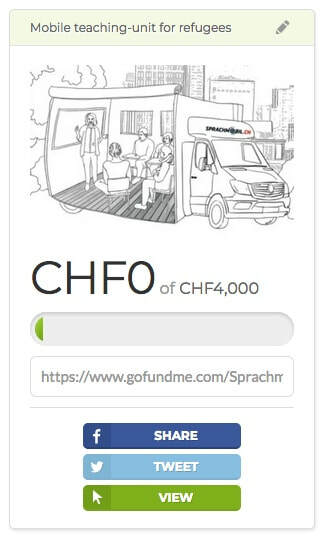 And - on the other side - sprachmobil.ch seeks volunteers, who want to be part of this project, who want to contribute with their hearts and skills to its development and growth and success. An other target group of sprachmobil.ch are all the people, who work in the fields with refugees (assistance, protection, education), such as heads of dormitories, social workers in communities and cities, corresponding employees of government institutions, commissions and offices. How one does has to envision the facilitation in the sprachmobil.ch? It is definitely our goal to offer in a relaxed learning atmosphere a language instruction orientated to every days life. We want the learning content to be based on the refugees everyday life, also based on their everyday life before they arrived in Switzerland. We want to get and to stay in touch with their resources to approach and learn a language, with the resources they have and which are also linked to their ability to speak their mother tongue. Thats also the reason why at the beginning we do not want to work with school books. And we do not want to make us dependent of the levels A1, A2, B1, B2 and so forth, knowing that to form learning units the reference of a level can be a criteria. What is very important to point out is, that sprachmobil.ch is not a competition for all existing language schools and institutions. Its more the opposite, it is a low threshold supplement.